Mayo 3-3 Kerry 1-3 (MacHale Park, 26/2/1939). MAYO: T Burke; J Popplewell, P Quinn, J Salmon; T Regan, G Ormsby, A O’Toole (0-1); H Kenny, M O’Malley; J Carney (1-0), P Judge (0-1), P Laffey; J Munnelly (0-1), P Moclair (1-0), T Hoban (1-0). Sub: J McGowan. Mayo 4-3 Galway 0-5 (MacHale Park, 12/3/1939). MAYO: T Burke; J McGowan, P Quinn, J Salmon; T Regan, G Ormsby, T Robinson; H Kenny, A O’Toole; J Carney, P Judge, P Laffey; J Munnelly (1-0), P Moclair (1-1), T Hoban (2-2, 1-2 from frees). Kerry 0-6 Mayo 1-6 (Tralee, 26/3/1939). MAYO: T Burke; J McGowan, P Quinn, J Salmon; T Regan, G Ormsby, T Robinson; H Kenny, A O’Toole; J Carney, P Judge (0-1), P Laffey; J Munnelly (0-2), P Moclair (1-0), T Hoban (0-3, frees). DIVISION A FINAL: Mayo 0-8 Laois 0-7 (Croke Park, 16/4/1939). MAYO: T Burke; J McGowan, P Quinn, J Salmon; T Regan, G Ormsby (0-2, both ’50s’), T Robinson; H Kenny, A O’Toole; J Carney (0-1), P Judge, P Laffey (0-1); J Munnelly (0-2), P Moclair (0-1), T Hoban (0-1, free). SEMI-FINAL: Wexford 0-6 Mayo 3-7 (Wexford, 30/4/1939). MAYO: T Burke; J McGowan, P Quinn, J Salmon; T Regan, G Ormsby (0-1, ’50’), T Robinson; H Kenny, A O’Toole; J Carney (1-0), P Judge (0-2), P Laffey (0-2); J Munnelly, P Moclair (1-2), T Hoban (1-0). Sub: P Flannelly. FINAL: Mayo 5-9 Meath 0-6 (James Stephens Park, Ballina, 14/5/1939). MAYO: Tom Burke; Jim McGowan, Paddy Quinn, Joe Salmon; Tommy Regan, George Ormsby (1-0), Tommy Robinson; Henry Kenny, Colm O’Toole; Jackie Carney (1-0), PJ Judge, Peter Laffey; Paddy Munnelly (1-1), Paddy Moclair (2-1), Tommy Hoban (0-7, three frees). SEMI-FINAL: Sligo 0-2 Mayo 2-10 (Sligo, 25/6/1939). MAYO: T Burke; J McGowan, P Quinn, P Kelly; T Regan, G Ormsby, T Robinson; H Kenny (0-1), P Flannelly; J Carney, M Hannon (0-1), P Laffey; J Munnelly (1-3), P Moclair (1-1), T Hoban (0-4). FINAL: Mayo 2-6 Galway 0-3 (Roscommon, 16/7/1939). MAYO: T Burke; J McGowan, P Quinn, P Kelly; T Regan, G Ormsby, T Robinson; H Kenny, P Flannelly (0-3); J Carney, A O’Toole, M Hannon (0-1); J Munnelly (0-1), P Moclair (2-1), T Hoban. Sub: P Judge. [Match abandoned after pitch invasion close to full-time. Connacht Council subsequently awarded the match and Connacht title to Mayo]. SEMI-FINAL: Mayo 0-4 Kerry 0-4 (Croke Park, 13/8/1939). MAYO: T Burke; J McGowan, P Quinn, P Kelly; T Regan, G Ormsby, T Robinson; H Kenny, P Flannelly (0-1); J Carney (0-1), A O’Toole, M Hannon; J Munnelly, P Moclair, T Hoban (0-2, one free). Sub: P Laffey. SEMI-FINAL (REPLAY): Kerry 3-8 Mayo 1-4 (Croke Park, 11/9/1939). MAYO: T Burke; J McGowan, P Quinn, P Kelly; T Regan, G Ormsby, T Robinson; H Kenny (0-1), P Flannelly; J Carney, A O’Toole, P Laffey (0-2); J Munnelly (1-0), P Moclair, T Hoban (0-1). Subs: P Robinson for McGowan, M Burke for T Burke, P Judge for O’Toole. The Mayo County Board decided in September 1939 to withdraw from the 1939/1940 NFL on the grounds that petrol rationing following the outbreak of war in Europe would lead to greater expense than in previous years. 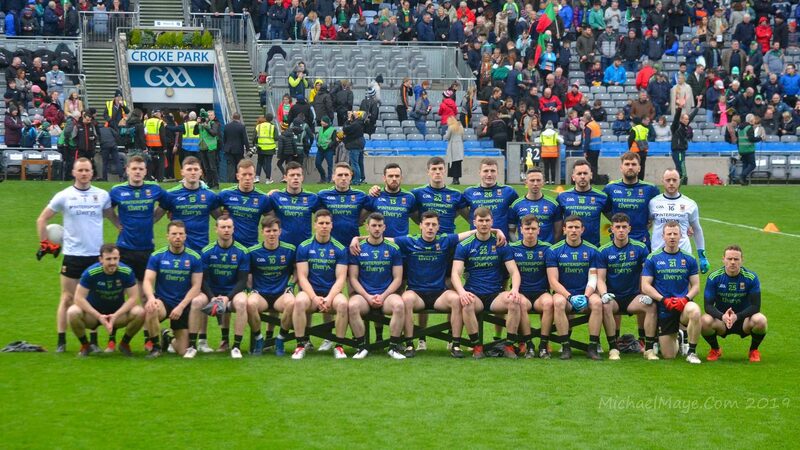 It has been suggested down the years that this decision may also have been due to a grievance over events that had occurred in the drawn All-Ireland semi-final against Kerry. See ‘The Road to 51’ pages 155-6 and 163. FINAL: Roscommon 1-10 Mayo 1-3 (Castlerea, 6/8/1939). MAYO: J McLoughlin; M Coyle, K O’Malley, B Byrne; J Waldron, S Flanagan, J Forde; J Reape, W Hastings; TA Ruane, M McNicholas, S Walsh (0-1, free); PV Cassidy, T Langan (0-1), MV Browne (1-1). Sources used: Padraig Ferguson’s Archive, The Green Above the Red, The Road to 51, Irish Press, Leitrim Observer, Western People, Connaught Telegraph.